yes, there is a good accordance with the well known formula ("finite wire in free space"). 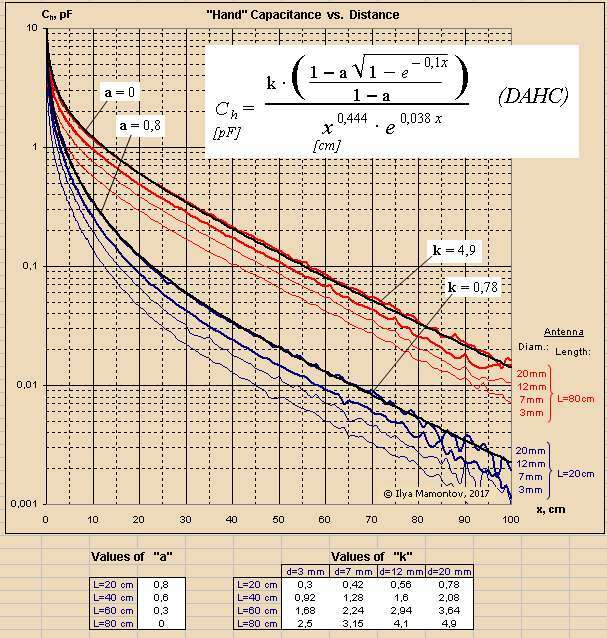 With the additional member =0.04 m you will achieve the error less 5 % in range L= 30 to 80 cm. But keep in mind that formulae are not doubly asymptotic: the behavor near zero point (L=0...d) is fairly abnormal. That's not so important, as I did not meet a theremin with antenna length 10 cm and less. It seems to be very well. I suppose the correction value 4 cm is empiric. What if you'd use a corrected L* instead L (twice in the known formula) regarding the short connection wire from oscillator to the rod? Yes, the value 4 cm was chosen in empirical way. I played with the basic formula in different ways and the version above is a reasonable compromise *complexity vs inaccuracy*. IMO there is no physical sense here. The antenna to oscillator wire has 2 cm length (approx.) and moreover, this extra (i.e. 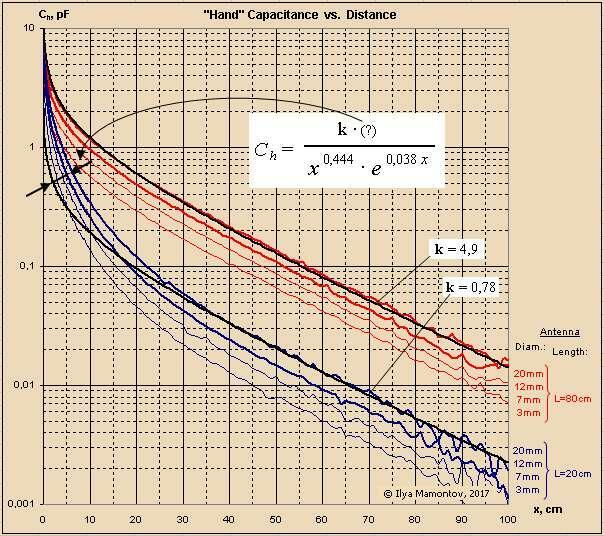 wire's) capacitance is eliminated by calibration. I remind you about my simulator based on antenna capacitance data obtained from the real experiments. Thanks a lot Ilya! You are an excellent programmer. What I am most interested in are the formulas behind (e.g. excel) and the physically background. I watched your interesting dispute with Dewster concerning the 1/d^x (x=1 or 1.7) dependence on hand capacitance in this thread. And here I have the next question. The direction of the front area of the hand (model or alive) in the several distances has influence on capacitance. A possibly difference comes from the moving path of the hand in the experiments. It is like a backhand in table tennis in your measurements. The vertical of the area is out of direction to the rod at higher distances. And like a right hand straight punch, in boxing called cross, always perpendicular in Dewsters experimental set. May be the difference is not very high, but is it negligible? My various data gathering simulations and experiments led me to believe that C is proportional enough to 1/d for Theremin use, but now I know that isn't entirely true. It's good enough for and entry-level or maybe mid-level instrument, certainly good enough for the volume side, but not good enough for the pitch side of a pro quality Theremin. I'm seeing pretty fantastic linearity with my latest scheme (where I subtract the frequency number from a constant that is slightly larger than it, then take the negative fractional power, and then feed this to an exponential response numerically controlled oscillator to generate the audio tone). I wonder if you have looked into this ILYA? "It is like a backhand in table tennis in your measurements. The vertical of the area is out of direction to the rod at higher distances. And like a right hand straight punch, in boxing called cross, always perpendicular in Dewsters experimental set. May be the difference is not very high, but is it negligible?" This is a very good question. Certainly some people play by addressing the antenna with the back of their hand, while others (the majority?) play with their fingers pointing at the antenna. My own data is of a ball/fist. I'm qualifying linearity on my prototype by open/closed hand gestures, which is sort of both I guess. It's very difficult to precisely measure bulk hand movement, but quite easy to make repeatable hand gestures. Having a pitch display is a godsend when doing this BTW. The relation kind of 1/x^1.7 was a first approach of weightlighter. It works satisfactorily just in a narrow range. length=80 cm. Plus, this formula is doubly asymptotic, i.e. it properly describes behavor near x=0 and at large distances (by members x^0.444 and e^0.038x correspondently). 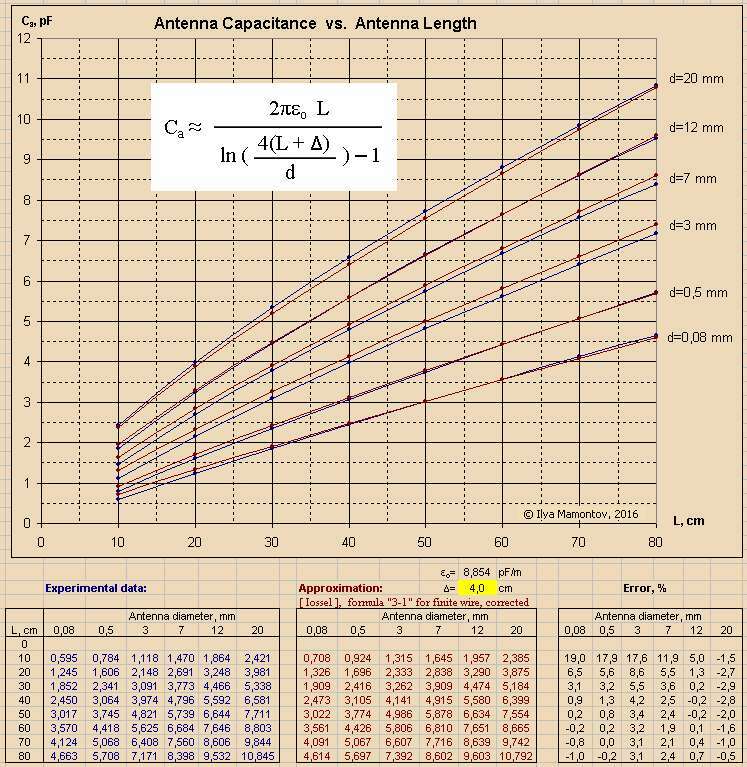 Parameter k depends only on antenna length and diameter. For short antennae, there is a discrepancy in crossover region (from function 1/x^0.444 to 1/e^0.038x). Sure, this situation can be corrected by unknown member "(?)". Yes, I agree all this things are true just for a specific hand shape ("flat plate") and moving path, but it was necessary to begin with something. Note. The distance "x" ("D") in model used is not a "true" distance. This is the path length across the arc. The value x=100 cm corresponds to angle 180 deg. ILYA, what about this additional part? not good, because this way you change the slope of the graph. All the curves have the same angle which is defined by "0.038x". So only the 0.038, ne plous, ne moeins as is written on the Theremin's coat of arms. Parameter "a" is choosen from 0 to 0.8 for given antenna length.